After mountain biking along the Monitor-Merrimac trail (click here for more info on that! ), we came to a gravel parking lot that was the start of a short nature hike to the Mill Canyon Dinosaur Trail. This is a great (and free) place to see dinosaur fossils in Moab. We highly recommend parking your bike for a moment and taking this short hike; it’s worth it! If you aren’t mountain biking the Monitor-Merrimac trail, you can also access the Mill Canyon Dinosaur Trail via car on a dirt road just about 13 miles north of Moab. 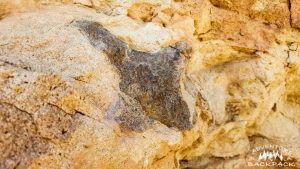 On this self-guided hike, you will see the fossilized remains of dinosaur bones. 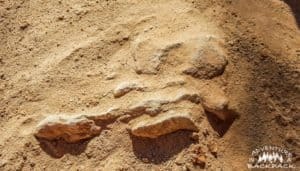 It appears a sauropod (which is a type of dinosaur that the brontosaurus falls into) died here years ago, and it’s remains are fossilized into the rock. You can see vertebrae, radius, and scapula of the sauropod, along with other bone fragments and fragments from a few other dinosaurs. The hike itself is an easy about 100-yard hike. There are signs along the trail telling you what you are looking at and what the fossilized bones came from. You can pick up a brochure from the BLM Field Office or download it HERE; otherwise, the signage tells quite a bit about the history of the trail. Because this is BLM Land, it is completely open to the public; there are no fees or fences or anything like that. These are the types of natural wonders that we enjoy seeing. However, if people can’t respect these natural areas, we will lose the privilege of being able to use them without regulations. 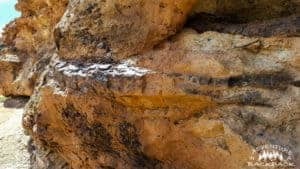 Along this trail, there is a spot where there was once a fossilized sauropod bone, but someone has come along and decided to chip it out and take it with them. This is VANDALISM. History like this is not for you or me or anyone else to take as a souvenir, it is for all of us to enjoy and experience. By taking this piece of fossilized bone, someone has stolen a piece of history from us. Not only does that not allow the Bureau of Land Management to trust the public to respect these historic sites, but it also prevents us from being able to preserve these sites for the future. So please, if you have learned anything from us or from nature, please remember that taking a piece of history is theft, and it should never be done. Please help us preserve this beautiful landscape for our children and grandchildren to enjoy as we are! Overall, we were surprised at how much we enjoyed this Dinosaur Trail. If you want to see dinosaur fossils in Moab, this is definitely worth checking out. It is so wonderful that you can go up and actually touch the fossilized bones and feel how different they feel from the surrounding rock. In addition to the fossilized bones, you can also learn how the rock formations around the trail came to be! If you are looking for more ideas of things to do in Moab, check out our other posts on mountain biking, hiking, Arches National Park, and climbing! And for even more ideas, check out the Visitor’s Center in Moab. Subscribe below for the most up to date posts from us! Until our next adventure, Live Vicariously!